Great Ormond Street Hospital is one of the world's leading children's hospitals. Where are you undertaking your current work placement and what have been the main responsibilities so far? I’m currently two months into my placement here at Great Ormond Street Hospital (GOSH) and the amount of skills I’ve picked up have been extremely beneficial. 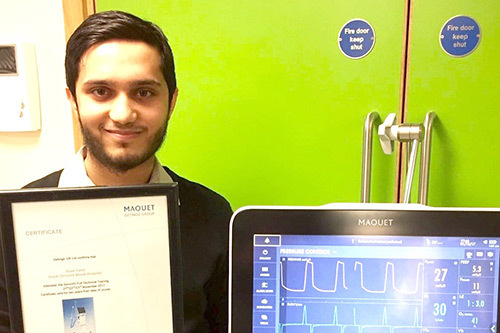 As a Biomedical Engineering placement student, I have been given an opportunity to work within the Medical Electronics department as well as the Intensive Care Unit (ICU) in one of the best children’s hospitals in the world. Biomedical Engineers typically advance into either one of these sectors, so to be working in both simultaneously is extremely beneficial for my career. What skills have you learnt during your time at the placement? During my time in the Medical Electronics department I have been involved in troubleshooting, repairing and maintaining a wide range of medical equipment such as Phillips Monitors, GE ECG machines, Masimo Pulse Oximeters, Alaris Infusion pumps, Ophthalmoscopes and Dräger Incubators. I also work in the ICU maintaining various different ventilators such as the Dräger VN500, EVITA and Servo U, in addition to Oscillators. My role in the ICU is predominantly a mix of troubleshooting, servicing and repairing ventilators which are actively helping patients in the Cardiac, Neonatal and Paediatric Intensive Care Units. Tell us about a positive standout moment during your placement which was most memorable? Working on wards at GOSH alongside some of the sickest patients in the country is a rewarding challenge and standout part of my placement. I must utilise my skills while remaining calm and composed in pressurised situations. Successfully troubleshooting equipment in an intense environment with patients and family all relying on you is a deeply fulfilling and eye-opening experience. What do you hope to achieve during your time at the placement? Being consistently successful is a great challenge and this is my fundamental goal whilst on placement. I’m taking each day as it comes and learning as much as I can in order to pick up more valuable skills which will stand me in good stead post-graduation. How do you think the placement will help with your overall career goals and aspirations? Undertaking a placement year in the real world has not only given me an idea of what I might do after graduating but it has also opened up a wealth of opportunities, no matter which path I decide to take.